According to preliminary data released in May, 68 percent of Moffat County School District third-graders scored proficient and advanced on the Transitional Colorado Assessment Program reading test this year. Third-grade TCAP reading results are released earlier than other test data so school districts can get a head start to help struggling readers. “The concern was that students who can’t read by third grade are at a significant disadvantage going forward,” said Jo O’Brien, Colorado Department of Education assistant commissioner. Note: Data is unavailable for Maybell Elementary School. The Moffat County School District is seeing gains in third-grade reading scores on the state’s standardized test. According to preliminary data the Colorado Department of Education released last month, 68 percent of the school district’s third-graders, on average, scored proficient and advanced on the Transitional Colorado Assessment Program test. That’s a 4-percent gain from last year’s Colorado Student Assessment Program results. Assistant Superintendent Brent Curtice lauded the students’ performance. Launched this year, TCAP is a temporary test “designed to support school districts as they transition to the new Colorado Academic Standards,” the Department of Education reported in a news release. School districts are scheduled to receive official third-grade TCAP reading scores, along with results from all other test areas, in mid-July, said Jo O’Brien, Colorado Department of Education assistant commissioner. Curtice cited Sandrock Elementary School’s scores as a high point. Preliminary results show 71 percent of the school’s third-graders scored proficient and advanced on the reading test, compared to 45 percent in 2010. Sandrock Elementary Principal Kamisha Siminoe was not available for comment Friday. Scores at Sunset and Ridgeview elementary schools were similar, with 74 and 70 percent of students scoring proficient and advanced, respectively. Data was unavailable for Maybell Elementary School. East Elementary School was the sole outlier, with 58 percent of its students scoring proficient or better on the test. That figure falls in line with the school’s third-grade reading score during the past several years. Although the school district’s overall score increased, it falls below the state average. 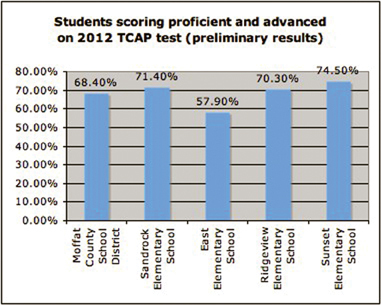 Nearly 74 percent of students across Colorado scored proficient and advanced on TCAP this year. Sunset Elementary was the sole school in the district to meet or exceed the state average, and it was the only school with students who scored at an advanced level. Curtice cautioned against comparing schools’ performance to other results because students take the TCAP for the first time in third grade, and the preliminary reading scores are only a baseline with which to compare students’ growth over time. “It’s not fair to compare it to anything at this point because this is just their first shot,” he said. O’Brien believes comparing schools’ results to the state average has limited value. The school district’s next step is to ensure reading scores improve over time, Curtice said. Curriculum alignment will be a major component of that goal, but he believes ongoing community involvement also is key. “The point is, schools can’t do it alone,” he said.